Raising the Roof | Cover Story | Style Weekly - Richmond, VA local news, arts, and events. If you can't make history, why not move it? Explore some of Richmond's grandest "mobile homes". In Virginia, where every patch of dirt is potentially sacred, many people were relieved that Meadow Farm — the storied birthplace of 1973 Triple Crown winner Secretariat — was off the endangered list. Just weeks before Tennessee-based Universal Fairs purchased Meadow Event Park, also home to the state fair, Preservation Virginia had placed the horse farm on its list of 11 most-endangered historic sites. Someday soon officials from Universal Fairs, while surveying their 350-acre purchase, probably will pause at the restored foaling shed where Secretariat was born and pay homage. Thing is, that's not really where the thoroughbred was born. When Meadow Event Park was built in 2009, the shed was moved from another site on the property, which was on the opposite side of Route 30. Developers felt the barn would add considerable cachet to their envisioned equestrian complex. If history belongs to those who write it, as some say, it follows that history also belongs to those who possess the physical evidence — the structures, if not the physical site — of where history was made. But when a building is moved, is its significance transported along with it? There's no question that historical context is diminished significantly and a sense of place is irrevocably lost. Nonetheless, for more than a century, Richmonders have had no problem intellectually with lifting a structure — or taking it down brick by brick — to plop it down somewhere else. There are a wide range of reasons. 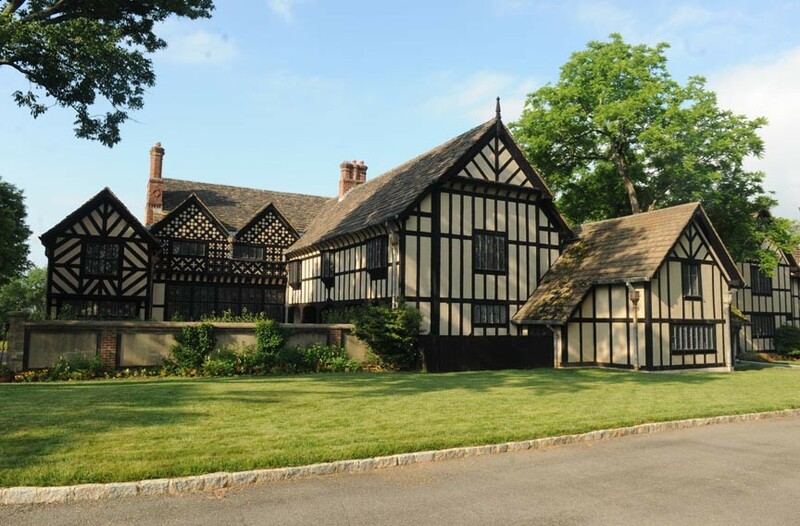 In the 1920s the developer of the Windsor Farms neighborhood hauled pieces of a 15th-century English mansion across the Atlantic to send a clear signal that Anglo-centric architecture would be the preferred stylistic approach. Downtown, during the Great Depression when every nickel counted, a municipal office building was rolled to a different site nearby to make way for a larger structure. In the 1960s, when expansion of the public library on East Franklin Street necessitated the removal of three antebellum row houses, an intrepid preservationist, at considerable personal expense, dissembled each one, brick by brick, rebuilding them on vacant lots in Church Hill. What do you give a man who has everything? Apparently not a house designed by William Lawrence Bottomley — the gold standard of domestic architecture in Richmond since the 1920s. 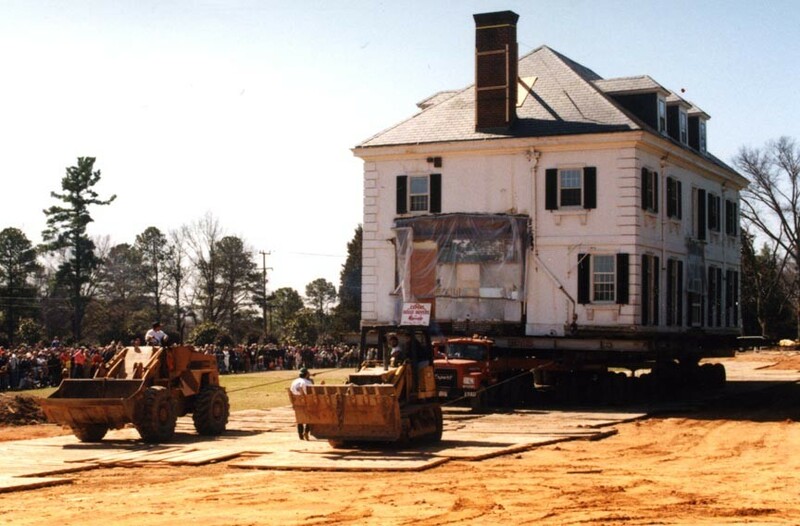 In March 1996 the 400-ton, Palladian villa-styled mansion — which stood at the 6705 River Road property of William H. Goodwin Jr., one of the community's wealthiest and most generous individuals — was rolled across the street, in one piece, up College Road and onto the University of Richmond campus. Expert House Movers, the company that has moved five historic lighthouses, including the beacon at Cape Hatteras, undertook the job using a massive hydraulic lift. Brilliantly, the university held a festive tailgate party for its donors and alumni to witness the move. At its new setting, the building was enlarged with an addition by another respected name in Richmond architecture, Marcellus, Wright, Cox and Smith, to become the core of the 28,300-square-foot Jepson Alumni Center, named for Robert Jepson, a 1964 alumnus of the university's business school. The new facility immediately became a sought-after venue for conferences, weddings and other functions. The former home itself is a guest house for alumni and other special university visitors. The house originally was built in 1915 for Col. and Mrs. Jennings C. Wise by the New York architecture firm of Hewitt and Bottomley. Mrs. Wise and William Bottomley had been school chums. The Wises were so pleased with the project that it led to a score of other Bottomley commissions here. The Goodwins built another house at 6705 River Road more to their liking. Moved to: 219 Governor St. Recycling aluminum cans may be second nature to some people. But recycling an aluminum building is something else. When the Aluminum Building downtown was completed in December 1931 at Broad and Governor streets, it was designed to offer temporary and inexpensive space for the city's Department of Public Works, which was overcrowded at its quarters in the Gothic Revival-styled City Hall on East Broad Street. 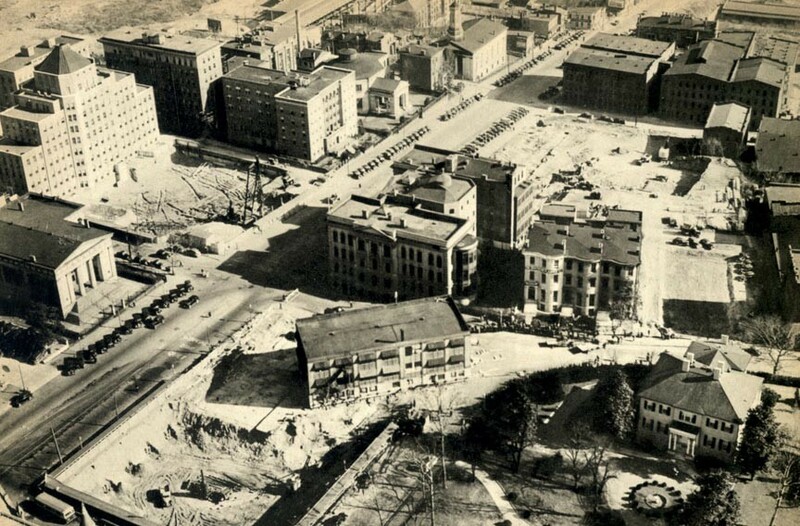 In November 1939, however, the site was chosen for a new state library and Virginia Supreme Court of Appeals building (now the Patrick Henry building, across from the Executive Mansion). 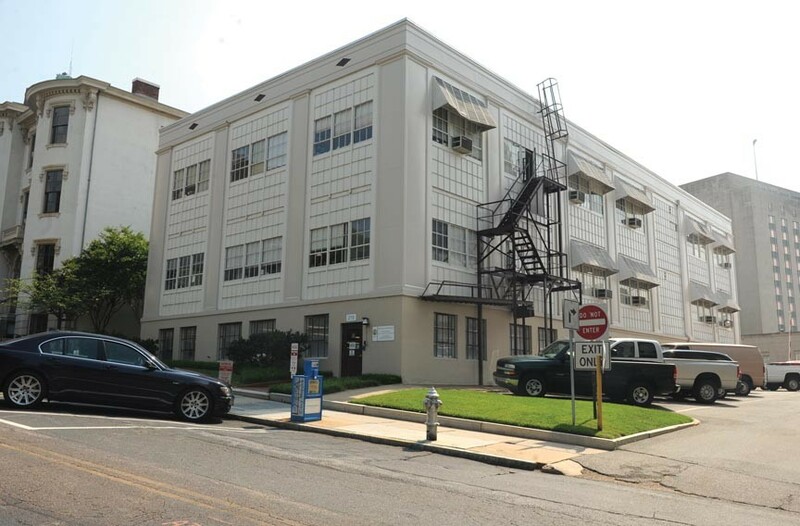 It was decided to move the Aluminum Building — lock, stock and barrel — to a vacant lot only a few yards away down Governor's Street next door to Morson's Row. In 1931, the innovative choice of aluminum as a building material was made at the suggestion of James Bolton, a city official. 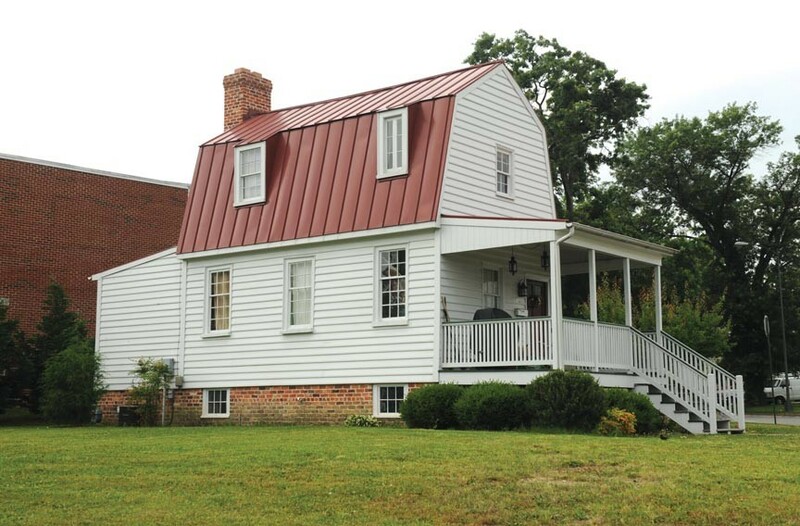 Locals hailed the structure as the nation's first all-aluminum building. Materials were provided by Alcoa and the corporation won kudos in the national press. But when a new State Library was destined for the site in 1939, the plan was to demolish the Aluminum Building. But this was during the Great Depression, and it was decided that saving it would be more economical. For the move, large timber beams were placed under the building as supports. Five wooden cylinders were placed under the timbers and the two-story building was inched down Shockoe Hill for 27 days. Incredibly, the department's employees continued to work inside throughout the process — did they feel like mountain goats, or what? Only one day of work was missed, the day when the heating system was disconnected. The city maintained offices here until 1972. Today it houses the state's Department of General Services offices. Moved from: 610 W. Cary St. 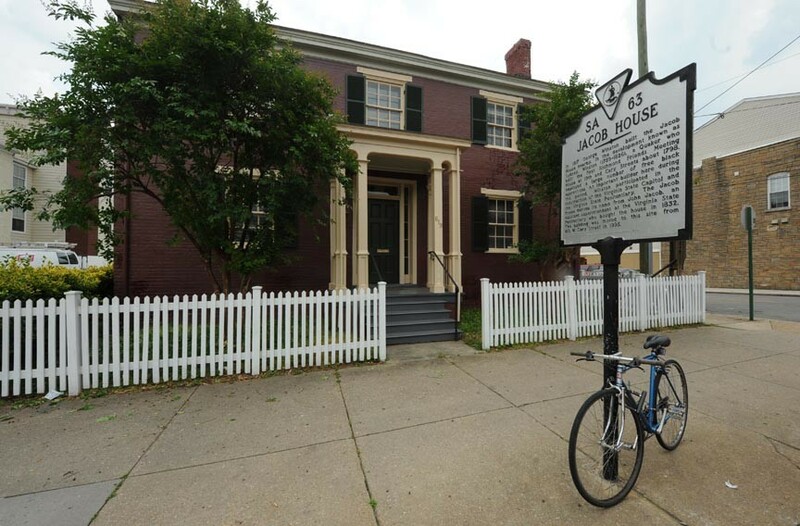 Moved to: 617 W. Cary St.
John Jacob was the first resident of the solid brick house now located at 617 W. Cary St. near Virginia Commonwealth University's Monroe Park campus. Jacob was assistant superintendent of the state penitentiary, which was located just a few blocks away on Belvidere Street in what's now the Fan. He also was a founder of what became Grace Baptist Church, now in Windsor Farms. Master builder George Winston (1759-1826) erected the house at 610 W. Cary St., across from its current site, as a speculative venture. He was a prominent Quaker, and under his direction free black craftsmen built this and many other brick houses and businesses in Shockoe Bottom and Church Hill. Prominent residents of the Jacob House later included canal boat builder John Messier and 19th-century illustrator Eugene Crehen, who designed uniforms during the Civil War. 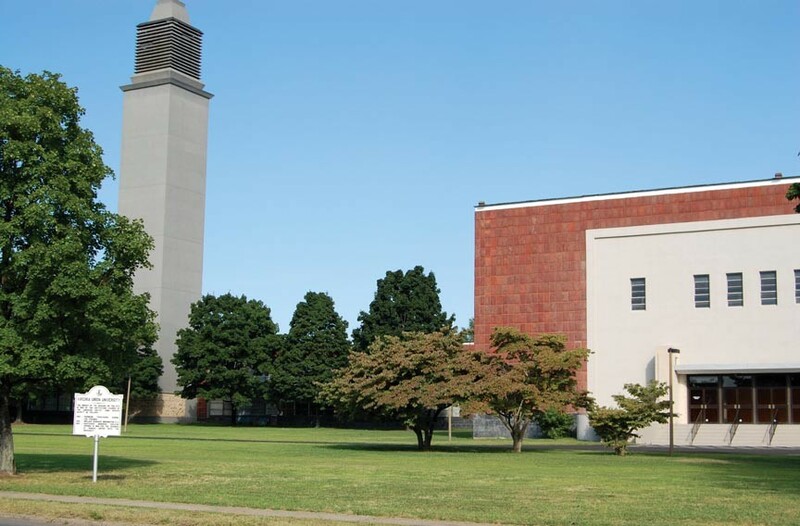 In the early-20th century it was the home of Edward Thurston Mankin, a brick manufacturer whose firm made the bricks for such landmarks as the Carillon and the Virginia Museum of Fine Arts. From the mid- to late-20th century the house served as a Baptist urban mission center and as the offices of architects Carneal and Johnston. In 1995, when VCU announced expansion plans for its school of engineering, preservationists weren't successful in persuading the university to keep the building in situ. Instead, VCU rolled it across Cary Street. Its former site is still a surface parking lot. And the Jacob House, restored by a private developer as an office building, is without a tenant. If you ever happen to stroll along East Grace Street on Church Hill, look up at the gable of the two-story dwelling located at 2515. There are two dates — 1848 and 1972. This is one of three houses that was on North Second Street between Main and Franklin streets. It housed the Little Chintz Shop and had a distinctive rounded, Roman arched doorway, a cast-iron balcony and stepped gables. When the Richmond Public Library announced plans to expand eastward from the corner of Franklin and First streets, this and two companion buildings were in harm's way. 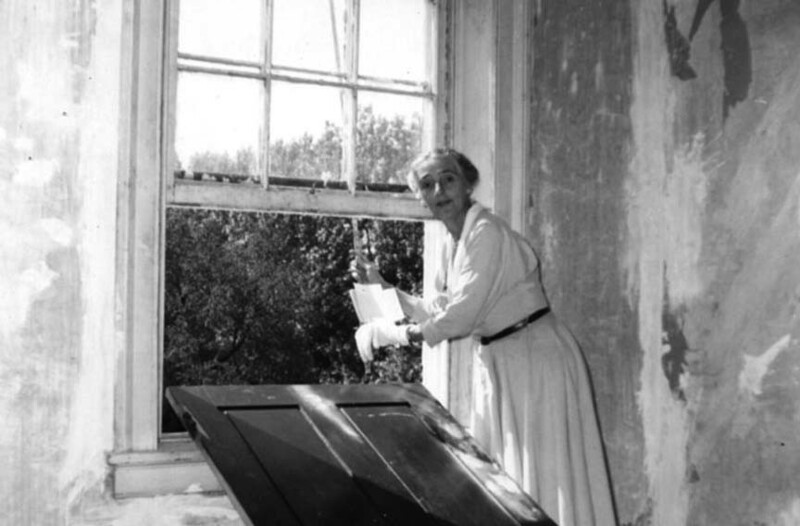 Elisabeth Scott Bocock, an irrepressible preservationist, took it upon herself to have the three dwellings dismantled and rebuilt in Church Hill. Bocock had co-founded the Historic Richmond Foundation in 1957 to preserve and restore the then-decayed neighborhood in the immediate vicinity of St. John's Church. She used these three houses as in-fill on vacant lots in the historic district. The other two houses are reconstructed in the 2600 block of East Franklin Street. Today, the house at 2515 E. Grace St. has the dates boldly emblazoned in beige-colored brick in its eastern gable — a gesture that that made some preservation purists wince. But it was Bocock's modus operandi never to ask permission. 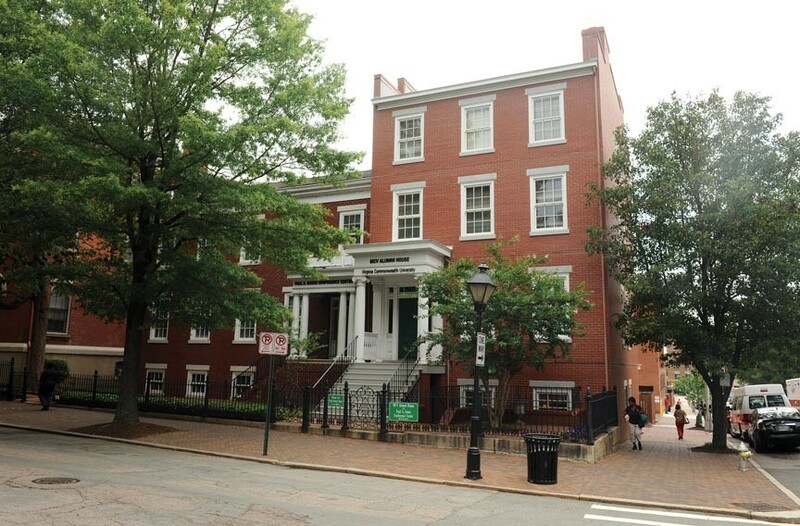 Another house that Bocock saved by taking it down — brick-by-brick, and then reassembling it — was a Shockoe Bottom dwelling that stands at 1103 Grove Ave. near the VCU campus. Richmonder Thomas C. Williams Jr., working with architect Henry Morse, shipped the half-timbered Agecroft Hall from Manchester, England, to Norfolk and then moved it by rail to a site overlooking the falls of the James River. This was just beyond the western city limits where Williams was developing his Windsor Farms subdivision (the neighborhood was annexed to Richmond in 1941). The 20-room, 15th-century dwelling, which originally had overlooked the Irwell River near the industrial city of Manchester, was threatened with encroaching development. On this side of the Atlantic the reconfigured manse was intended to serve as the Williams' home as well as provide the pièce de résistance among Windsor Farms' 520 building sites. Williams built the neighborhood's community and office buildings on a green in a similar, half-timbered, medieval style and sought to develop the neighborhood, as he put it to one magazine writer, into "a residential park where he would be surrounded by desirable neighbors." Promotional literature made it clear that Jews were't welcome. Today in Windsor Farms, colonial revival style homes far outnumber half-timbered style residences — and there are black and Jewish homeowners. Now, Agecroft Hall is a house museum surrounded by handsome gardens and breathtaking vistas. A various times throughout its long existence, the evocatively charming, 820 square-foot Tucker Cottage was considered too sweet to lose: It has been moved twice. Probably the oldest house in Jackson Ward, its Dutch gambrel (double-pitched) roof is the last of its type to survive from 18th- and early turn-of-the-19th-century Richmond. In addition to its unusual roof, the cottage's oversized chimney was a distinguishing characteristic. The modest dwelling, built around 1798 near the corner of Third and Leigh streets, was first owned by Joel Tucker. When he died, his widow had the building moved to 614 N. Third St. and built a larger house on the lot, which had appreciated in value. Until recently, and for as long as anyone alive can remember, the Tucker Cottage has been located (turned endwise) immediately south of Third Street Bethel A.M.E. Church. For many years it was the home of Martha Carr, a black woman who took considerable pride in having been both baptized and married by John Jasper, the famous clergyman and colorful 19th-century orator, whose birthday bicentennial is being marked this year by his church, Sixth Mount Zion Baptist. In 2000 the city of Richmond rescued the Tucker Cottage when Third Street church sought to expand on the site. After an uncertain future, the house was placed on permanent foundations at 701 Chamberlayne Parkway in 2007, on a lot fronting Interstate 95 at the northwestern edge of Jackson Ward. Perhaps over time, maturing landscaping will make the building look more at home here. Moved from: 1105 E. Clay St.
Matthew Fontaine Maury was a noted sailor and scientist best-known for having first charted all the oceans of the earth and being part of the brain reserve of the Confederacy. He was instrumental in developing ironclad ships. 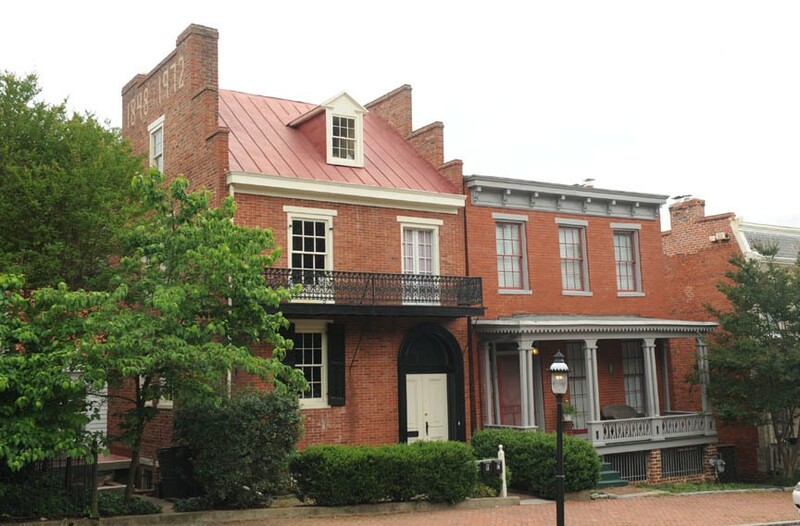 At one point in his career he rented quarters at 1105 E. Clay St. in the handsome, Italianate home of a cousin, Dr. Socrates Maupin, a professor at the Medical College of Virginia. It was while residing here that Maury conducted experiments with developing torpedoes using an upstairs bathtub as his laboratory. In the 1990s VCU demolished the historic building and then rebuilt it, brick by brick, across the street. Now in the 1000 block of East Clay, it fleshes out one of the few complete blocks downtown of 19th-century architecture. Today the building serves as alumni center for VCU's Medical College of Virginia. The most visible building on the Virginia Union University campus, the Belgian Friendship Building at Lombardy Street and Brook Road, didn't originate in Richmond. It was shipped here from New York. But it didn't originate there either. It was designed and constructed in Belgium to signify the supremacy of Belgium modernism and architecture. It was then shipped — part by part — to New York, where it served as the Belgium pavilion at the 1939 New York World's Fair — "The World of Tomorrow." After the fair's run, the plan was to send it back to Europe, where it would be reconstructed on a permanent site. But by the end of the fair, Europe was at war and there were no ships available for such a symbolic architectural effort. New York City wanted the site cleared as quickly as possible for the expansion of LaGuardia Airport. So Virginia Union was selected as the building's recipient. Shipped by rail, the former pavilion was re-erected on VUU's campus by building students in 1942 under the supervision of Charles T. Russell (1875-1952) the most noted black Richmond architect of the early-20th century. He'd designed faculty houses (all of them now demolished) and had restored some of the North Side campus' first generation buildings. Parts of the complex have various names. There is Barco-Stevens Hall. The former carillon (the bells went to Stanford University) is the Vann Tower. Another part of the building is William J. Clark Hall. The tower is undergoing restoration.